As subsurface drip irrigation (SDI) gains traction with alfalfa growers, consultants and system designers recommend they become fully aware of important factors, before installation, to achieve a successful outcome. Growers, they say, who are willing to spend the money must also be prepared to shoulder a higher management approach. This includes understanding their source of water and its quality, being more attuned to timely rodent control, and becoming familiar with new equipment and how its delivery can be used effectively to improve yields over surface irrigation methods. Other questions, such as what the grower will be using in rotation, should be taken into consideration when discussing row spacing. Emitter spacing and the depth of the dripline also needs to be addressed based on factors, such as soil texture, found in individual fields. That mindset for success, Smith notes, means taking on a higher degree of diligence to monitor a technological system, comprised of a filtration component and pumps to pressurize the system, and use the information to grow a better crop. Despite lower hay prices, he adds, there are growers who are deciding that SDI makes sense because they know the importance of being the best grower they can be. “They are doing more with less,” Smith says, adding, “their level of sophistication as knowledgeable agriculturists raises their level of being conservationists and custodians of the land.” Dennis Hannaford, Netafim’s product application support specialist, works with growers who are ready to embrace using SDI for their alfalfa production. He agrees with Smith’s assessment of those making plans to install SDI need to raise the bar on monitoring fields. He urges growers to prep their fields prior to installing a system to establish optimum and manageable growing conditions up front. Hannaford urges them to start by getting an informative soil nutrient analysis, ripping the ground to encourage deep roots and developing an effective rodent control program. Smith concurs, saying the importance of a having a good rodent program in place before installing a drip system helps minimize the damaging aftermath of these pests. Hannaford adds growers should have a rotation plan in mind so the system can be designed for the beneficial use on multiple crops. Daniel Putnam, an extension agronomist and forage specialist with the University of California Davis, presented a talk this past March in Arizona focused on adapting to new technologies During the discussion, he provided extensive details about growing alfalfa with SDI. 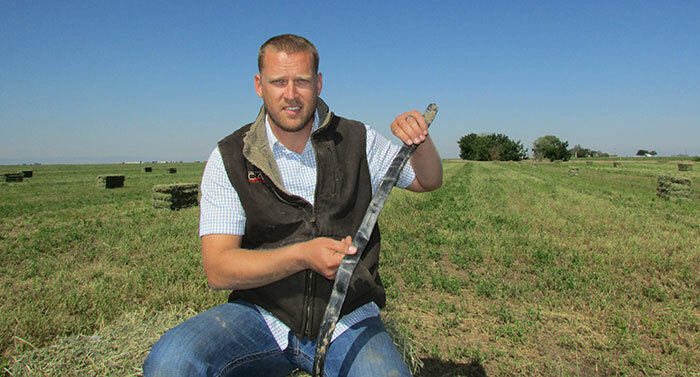 While he noted that alfalfa has lost acreage to other crops and water limitations, there continues to be a strong demand for this forage. Known for his expertise in alfalfa, Putnam studies a number of SDI questions to help growers and installers design efficient systems. In a January 2016 article Putnam wrote for Hay and Forage Grower, he provided general parameters for installing a system. The driplines, he wrote, are installed 8 to 14 inches below the surface at 30 to 40-inch spacing, with some 60 inches apart. Smith, who works with growers to design the most advantageous SDI program for their specific needs, says installation is mostly standard on 40-inch beds, but he can adjust for variations. “Getting uniformity is the key for improving yields and getting weed pressure down,” he says, adding that when he sees that uniformity in alfalfa fields, where he’s installed a SDI system, it’s one of the most rewarding aspects of his work.